If you've been to the Florida Keys you already know all about the sunshine, the perfect sunsets and the laid back lifestyle but what you might not know about lies nestled in between the palm trees. In fact, if you've driven to Key West in the past 2 years you've driven right by it and probably not even noticed. Just off of the Overseas Highway on Islamorada, among the palm trees in a small yellow and turquoise building is Islamorada Beer Company. 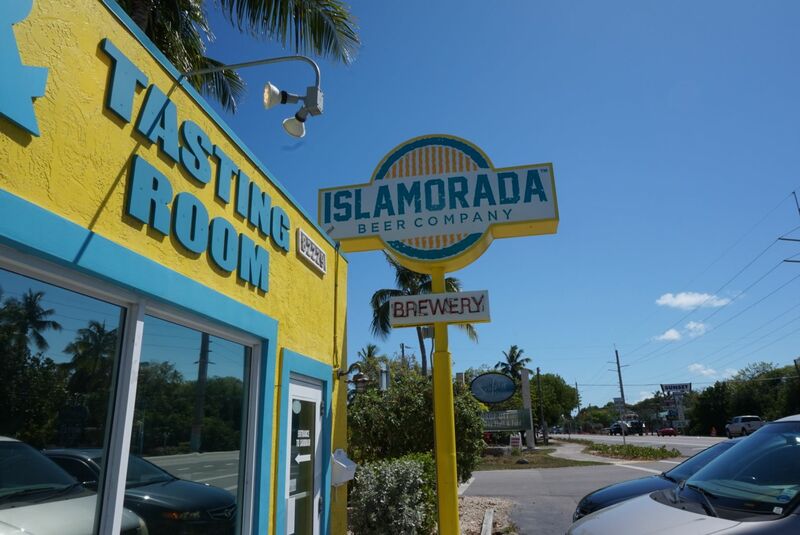 Opened in 2014, Islamorada Beer Company is home to three core beers, a few blends and an assortment of beers you can only get on tap in the tasting room. They also have a few rotating seasonal brews you can only get there or possibly at a local restaurant in the Keys. The Sandbar Sunday American wheat ale is perhaps their most popular beer and with it's light citrus flavor paired with it's refreshing crispness it's easy to see why. Garnish it with a slice Key lime and relax on the beach (or sandbar) and get the maximum enjoyment out of every sip. The Islamorada Ale is the perfect blend of hops and citrus making it easy to drink on a hot day. It skews a little on the sweet side but the natural citrus notes make this blonde ale very easy to drink...emphasis on very! The Channel Marker IPA is a great entry level session IPA. The hoppiness isn't overpowering and the citrus notes make it simple and pleasant to sip on. It's lighter in body and bitterness compared to a normal IPA but perfect for watching the sunset. If you're looking to get into an "island state of mind" or just looking for a delicious brew to sip on in paradise, stop by and ask your local beer consultant if they can get you an Islamorada Beer Company brew or just look for the bright yellow and turquoise building settled in the palms on Overseas Highway. You won't be disappointed! That looks like so much fun. I love the names of their beer too! Based on your description I think I would really like the Islamorada ale! I love citrus notes in beer! i just love this place! i still use the tumbler i got there, daily :) that beer is dangerously addictive! oh take me back already! Definitely passing this onto my beer-loving friends. I love the yellow and blue color palette! I love visiting local beer companies on vacation! So fun! Next time we go down we'll make a stop here. My husband would LOVE it! I don't care for beer, but my husband would love something like this & I love when you share cool places like this-- in case we ever get to make it down to florida! These all sound like the perfect beach beers! Such a cute little spot! What a great way to kick off a fun beach weekend! My boyfriend and I like to hit local distilleries + bars with local beer selections when we're traveling- just did a beer tour when in Colorado last month! So fun! You know I love me some craft beer all of these sound amazing! 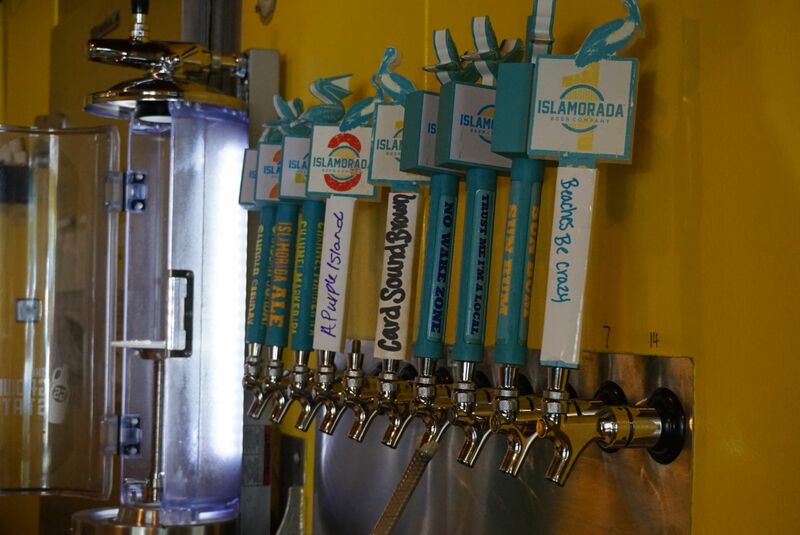 The Islamorada Ale sounds yummy! did you try the No Wake Zone?! Um coconut key lime?! Yum! I'm not a big beer drinker, but I love the names and the colors of this place...total island vibes! I think that I'd be initially drawn in by the fun and bright and colors and then I'd definitely stay for the Sandbar Sunday! 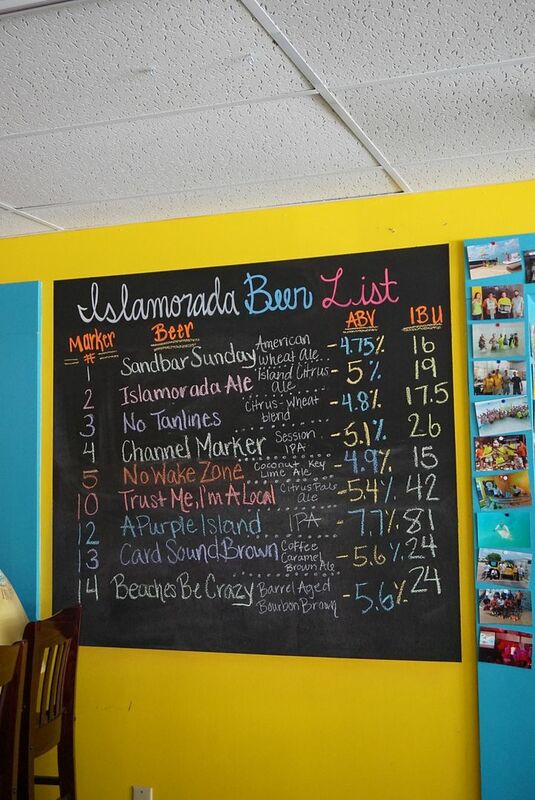 I definitely need to check out Islamorada Beer Co when I make it to the Florida Keyes! This makes me want to go on vacation immediately. I love the overall vibe of this spot! Oh I love a brewery and I love beach vibes, this sounds like my kind of place! So fun! Beer tasting is always a good time - this place looks great! What a fun place! 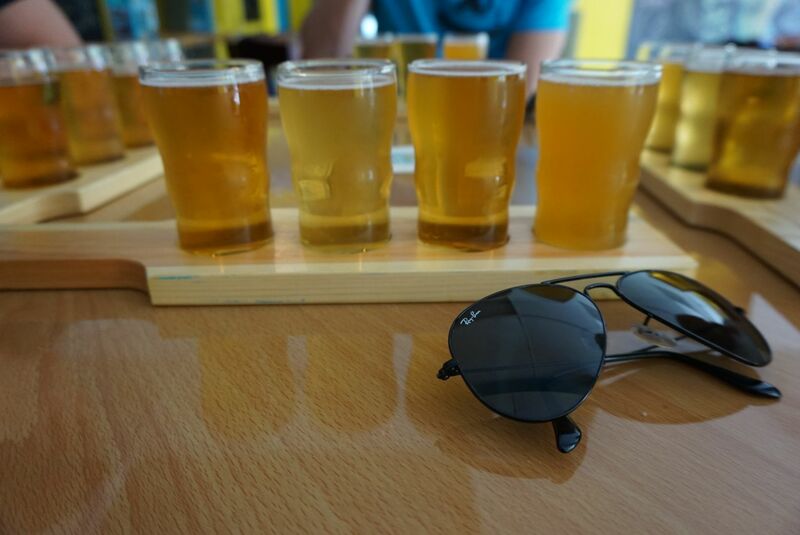 And as hot as today has been - those flights would taste perfect right now! Oh this sounds fun, and the perfect place to go on a boiling day. 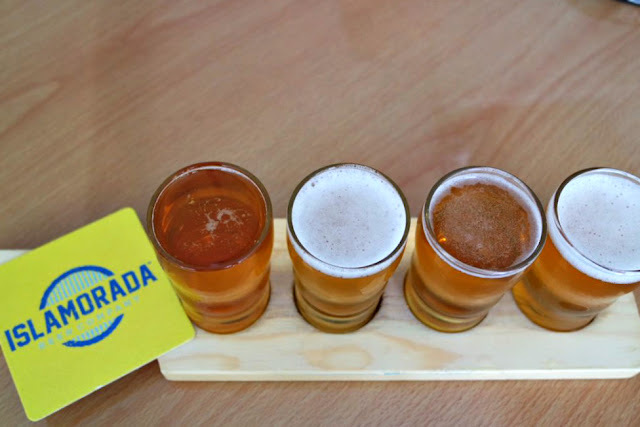 I love beer tasting and local beer! I'm dying to visit here! ahh this looks like so much fun!! my husband just experienced the keys for the first time [i have yet to visit!!] and he loved it down there!! I'm not a beer drinker, but I bet this is a fun place to visit. Heck, I would probably give a few beers a taste...haha! All of these sound so refreshing! That IPA- yum! YUM! This post just makes me wish I was sitting at the beach sipping on a cold beer! What a fun place!! I'm so want to go tour Cisco Brewers in Nantucket. I have never toured a brewery but really want to. This is so fun! Ryan would love this. It's always trying out different breweries and I love the relaxed Florida theme of this one. Will definitely stop in to sample some brews when we finally make it down that way. Not a beer girl, but this looks like so much fun!